You don’t get a second chance with the important things …. To find out the non-definitive answer to this question you will have to watch Arild Fröhlich‘s 2016 film Grand Hotel, coming straight from Norway. Not a Coming-of-Age movie per se, it does feature many rite-of-passage nuances, life truths and valuable observations affecting the life of its lead protagonists. 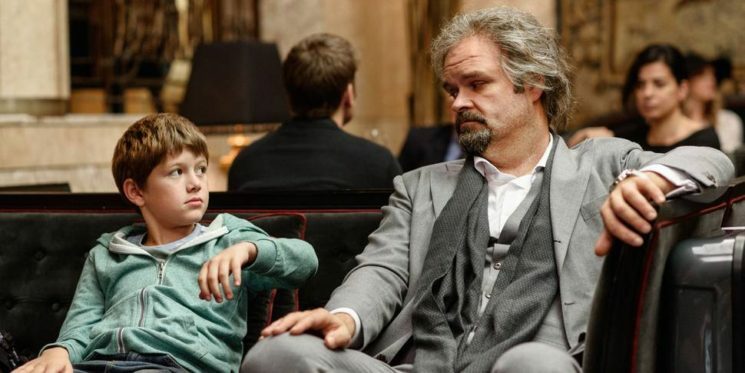 They happen to be Axel Farstad (Atle Antonsen) a self-assured, snobby and arrogant best-selling author who has a serious life-threatening issue with alcohol and the charming ten-year-old Noah (Håkon Bøhmer) whose Tourette’s Syndrome (repetitive, stereotyped, involuntary movements and vocalizations called tics) and ADHD make a perfect target for the school bullies. 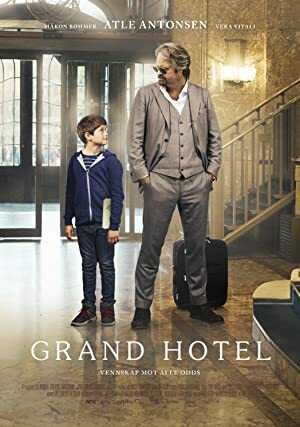 The first encounter between Alex and Noah (one of the funniest scenes in the film, which also reveals a lot about their characters from the get go) takes places in the lobby of the city’s Grand Hotel. Noah’s mother (Vera Vitali) works as a receptionist in the hotel, while Alex is checking in, in an attempt to get back to his former glory as a prosperous author …in the days before the alcohol took control. You aren’t cute just because you are a kid. Some circumstances and turn of events make Alex responsible for Noah – and it is their interaction that provides the largest amount of Coming-of-Age nuances in the film. Of course the story of an inter generational friendship between a grumpy man and a young inquisitive kid has often been addressed in the Coming-of-Age cinema (Clint Eastwood‘s 1982 film Honkytonk Man or more recently Theodore Melfi’s 2014 film St. Vincent, starring Bill Murray and Jaeden Lieberher, are just two examples). But the Norwegian Grand Hotel offers a unique twist, thanks to the strong social subplots and the variety of themes it addresses: single moms and their peculiarities, the importance of being oneself, how to be a jerk, how to be a friend, alcoholism and, last but not least, second chances or the lack of them. Most of the characterization in the film is done through dialogue, while the film’s conflicts are predominately internal with the characters struggling for dignity against the human weaknesses present in their own personalities. 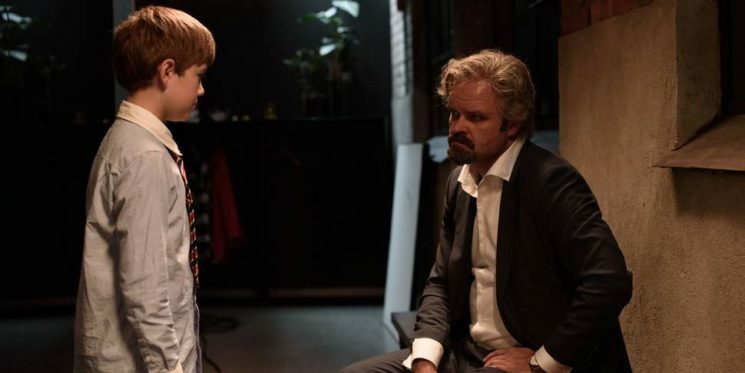 Both Atle Antonsen and the young Håkon Bøhmer are extremely convincing in their roles of troubled adult and troubled kid – and one is able to observe how their interaction alters their personalities. The film’s central message is believing in oneself and others, giving a chance to people and receiving them yourself. It offers a lot of room for interpretation, but it can also be enjoyed on a superficial level depending on one’s preferences. As an added extra, by the end of the film you are likely to know one swear word in Norwegian, which could be an advantage depending on one’s viewpoint. And, if you get into trouble, you can always blame it on the Tourette’s Syndrome. Nothing disappointed me in the way the story was told, not even the ending. As a whole, Grand Hotel exceeded all of my expectations (which are often high, especially when it comes to Scandinavian cinema). This is a pleasant cinematic experience well worth one’s time. Grand Hotel is a must see. About a pompous, aging alcoholic and a tourettes-inflicted ten-year-old boy who are forced to spend a week together at a high-end hotel. The only thing these two have in common is that they are both difficult to like. The hotel serves as their shared escape from the outside world and the problems it presents.